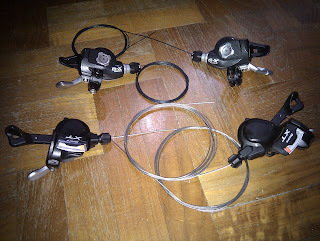 Just got a new set of XT and X9 Shifters, and thought it would be a good chance to compare the performance of these shifters. Same cassette and chain is being used for comparison, albeit on two slightly different bikes. Shifting performance is based on shifting while in the repair stand. XT shifter is paired with an Ultegra 6700 RD (Short Cage), while X9 shifter goes with the X9 RD (Short Cage). The gear cable for the XT is much longer than the one that comes with the X9, at least 50cm longer. This proved to have a big effect on the cable routing required. 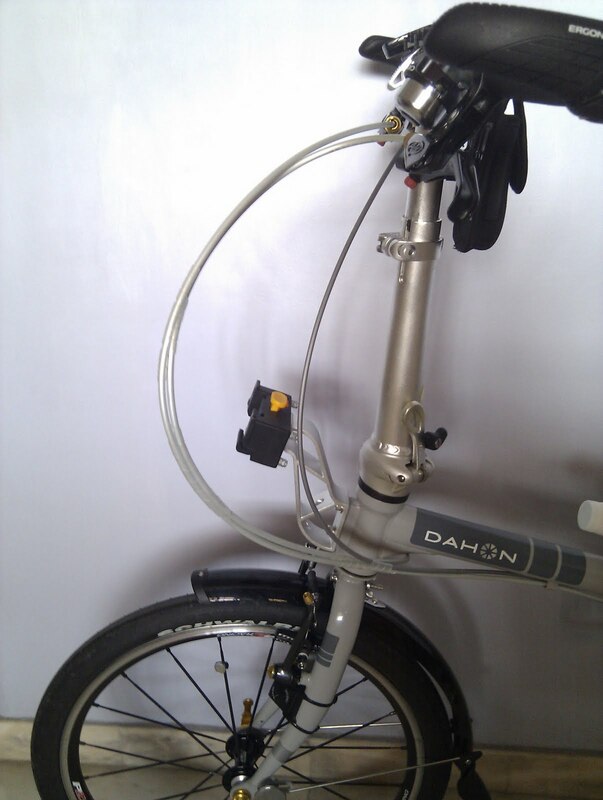 Note that for the X9 equipped bike, because of the short gear cable, the cable housing needs to be much shorter in order for the cable to reach the RD. This is despite the fact that the Ultegra RD needs a loop at the back for the cable to enter the RD. 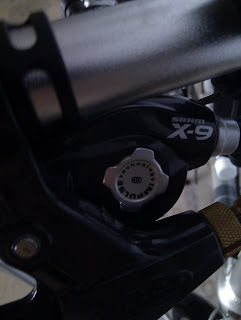 Additional Info: XT shifter comes with a gear indicator, but it can also be removed if desired. Much easier to connect gear cable to the Ultegra RD. Straight forward and visible. 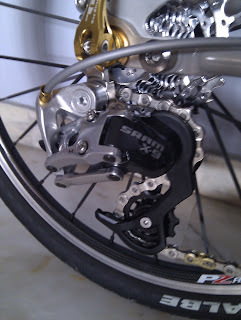 On the other hand, the X9 derailleur has an extra guide at the back to route the gear cable. Cable fixing bolt is hidden under/behind the RD, making it difficult to see and fix the cable. Strictly speaking, this is off topic as its not about the shifter, but its something to take note when installing shifter and RD. Downshifting means shifting to a lower (easier) gear, or in other words going to a larger sprocket. 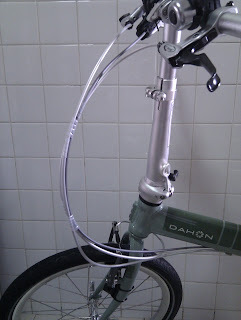 Downshifting for both shifters is accomplished by pushing the thumb lever (silver coloured). Downshifting for the XT lever seems a little more laboured, as it takes more effort to push the lever compared to the X9 shifter. But this could be because of the different RD that is being used, perhaps the spring in the Ultegra RD is stronger than the X9 RD spring. X9 wins in this case, as the shifting is pretty effortless, and X9 employs this technology called Zero Loss, which means that the lever engages the moment you push it. There is no free play before engagement, unlike the XT shifter which has a bit of free play. 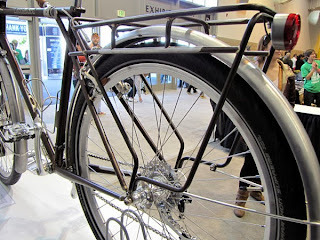 Upshifting means shifting to a harder gear, higher gear number, smaller sprocket, what ever you call it. 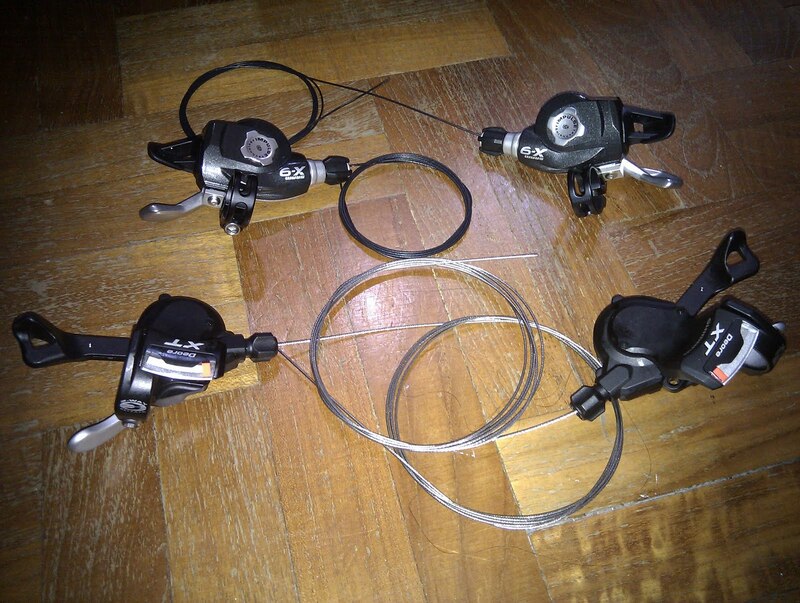 This is where the shifters are different. 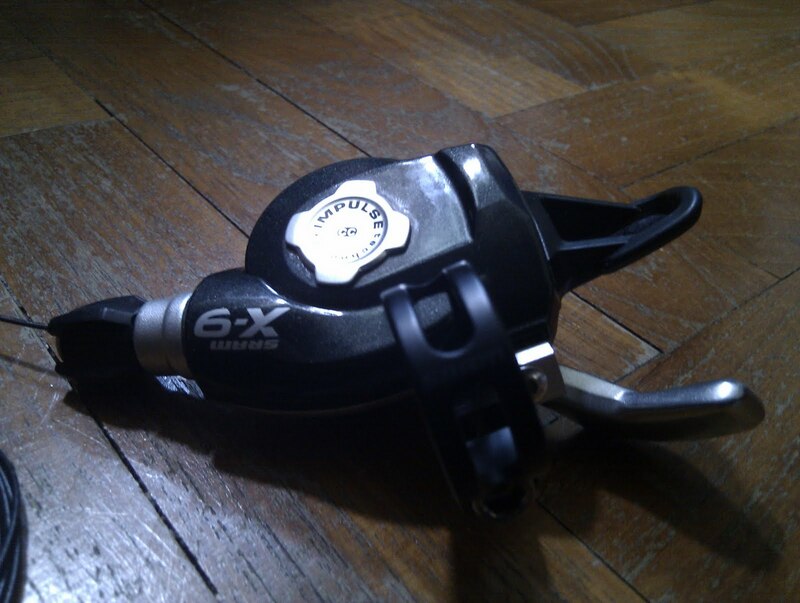 The XT shifter uses a long black lever to actuate the upshifting. The cool thing about this XT shifter is that upshifting can be done either by pushing the black lever with your thumb, or pulling it back with your finger. Upshifting is fast for the XT shifter because Instant Release is used, where pushing the button releases the cable immediately. Whereas for the X9 shifter (and many other shifters), pushing the lever/button only releases half the cable, and only upon releasing the lever/button then the rest of the cable is let out. 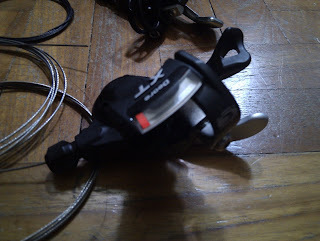 SRAM Shifters also differ from Shimano and other shifters in that both up and downshifting are actuated by the thumb, while Shimano uses the thumb and finger separately. I personally like the thumb-thumb shifting, because its possible to downshift and brake at the same time. On the other hand, some people are used to the Shimano thumb-finger shifting way and cannot get used to the SRAM style of shifting. I guess in the end its down to personal preference and adaptability, its not about whether one is better than the other. 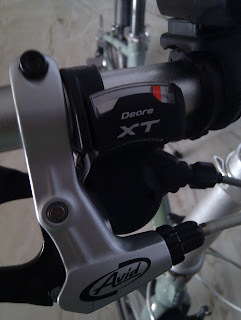 The XT shifters seems to be slightly slower in downshifting, while it is faster in upshifting. The X9 shifting is good up or down. Also, its much easier to calibrate the shifting for the X9 shifter, where the alignment is perfect all throughout the gears. As for the XT shifter, the alignment seems to be slightly off at the lower gears, where cable tension is highest. It still works but not as good as the X9 shifter/RD combo. 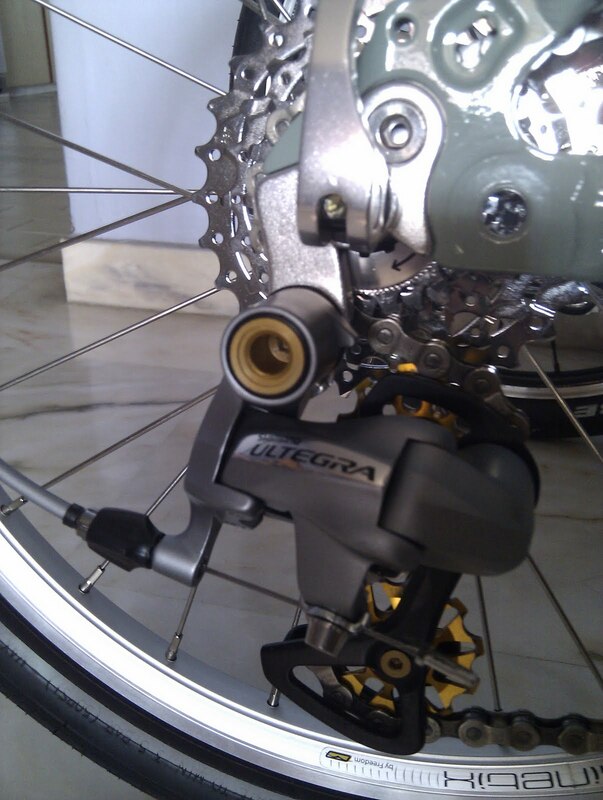 It may be because of the Ultegra RD, which seems to struggle a bit to reach the 28T sprocket. No conclusion yet! 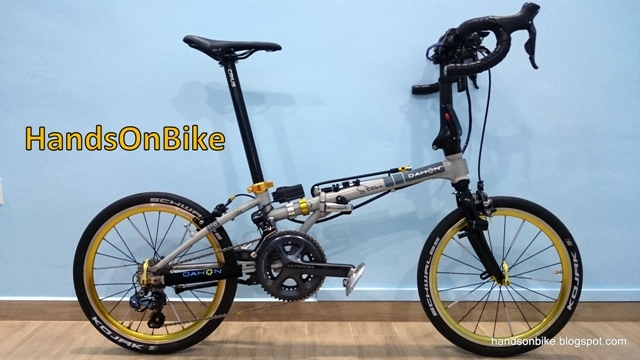 Still need to test ride the bikes and try the shifting while riding the bike, will update once the testing is done! Meanwhile, more pictures! The conclusion of "Shimano XT Shifters vs SRAM X9 Shifters" is now up! Read the second part here.